Something new I tried last year was getting rid of my teacher desk. said goodbye to the massive, clunky metal desk that had served well for the last five years. Granted, this was partly because I have a room half the size of normal classrooms… but my class size still runs 15-18 students. There wasn’t room for a desk and intervention table. After teaching the previous year with a desk but no small group table, I decided to dispense with the desk and ask for an intervention table. I had help, though. 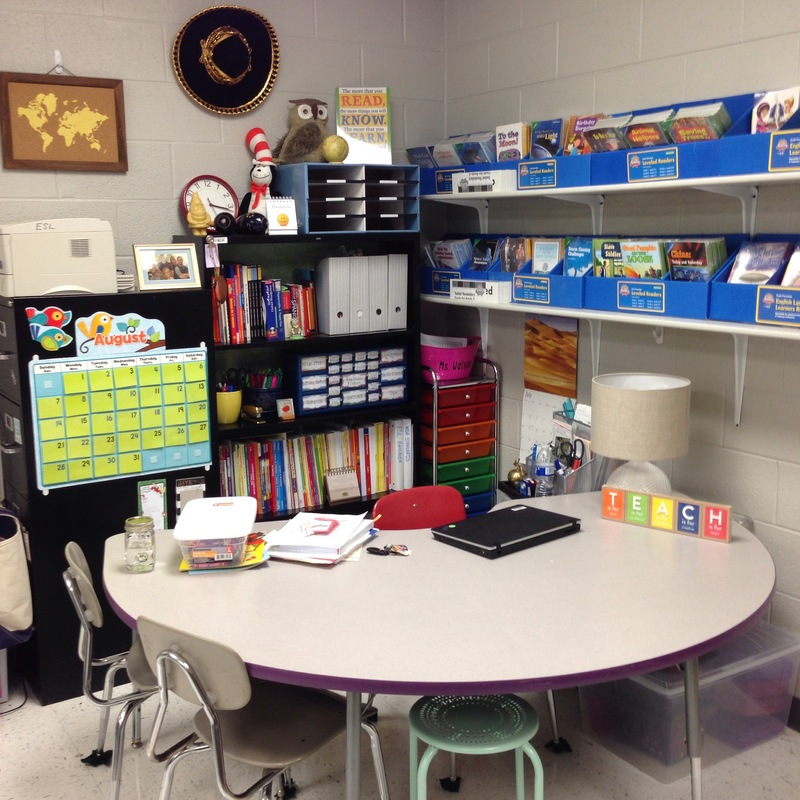 There are several helpful blogs highlighting the benefits of a teacher “space” over a teacher desk. From them (thanks, Pinterest) I got some ideas and gave “teacher space” a go. It went well enough that I’m doing for a second year. The picture above is from last year in the final stages of setting up my classroom. Several issues popped up that I hadn’t anticipated, which I have tweaked this year and it has already helped so much. Negative: The printer actually ended up on the table… along with stacks of paper. Keep a lamp that big was not a viable option when students came to sit at the table. True, I had access to the printer easily… but that was not something I needed. Positive: I had good access to the teacher books behind me, as well as my supply organizer, which I’m still using (it’s so helpful that the kids can get their own band-aids now). Ok, I know that I can’t expect to have a Pinterest perfect classroom, but that shouldn’t rule out keeping aesthetic in mind. Positive: The big, clunky desk was gone. Negative: Looking back at that picture, the furniture is different depths, there are too many colors, too many drawers… it was organization flirting with chaos. Positive: I had a small group table, which I did not have the year before. Negative: Since the teacher space was also the small group space, students had trouble understanding and respecting the boundary lines that a teacher’s desk should have. This year, I kept in mind the positives and tried to incorporate them. It involved switching around several things in the classroom (check for upcoming classroom organization post). These bookshelves had originally been in classroom library. However, this set up was similar to something I had a couple years ago, and I regularly use this small white board with group work. Using these bookcases gave me more horizontal work space — something I had needed before. Granted, one of my classes has all students from last year, which made it easier. However, I had two new classes this year. At the beginning of the year, I told the students that the teacher chair and space behind the table was my space. As the year went on, I added things students were allowed to access — the foreign language dictionary shelf and the staples/band aids. They also know not to look through any copies that I might have on the table. My students sometimes ask if they can work in my chair or move a stack of papers for more space (which I usually agree to). All things considered, this teacher space works for me and my classroom. It gives me more space to work. My materials are accessible for planning and group work. My students like the set-up. Parent-Teacher conferences around this table work great. Sure, it takes a minute to adapt. Sometimes I still miss having a junk drawer. Sometimes, it still gets messy — copies attack, ya’ll. So, if you think if could solve space issues or just help with the look of your room, give it a try. Posted on January 22, 2018 by Katie •	This entry was posted in School and tagged classroom, classroom culture, classroom management, classroom organization, classroom setup, desk free, small group space, small group table, teacher space. Bookmark the permalink.